the little red house: yes, we eat a lot of pizza. I love it. I can't get enough these days. When I'm not eating it, I'm probably thinking about it.....strange? no. I'm still using the same old crust recipe--I can quickly throw it together from memory (although this time I added a teensy bit of wheat flour). I still used the grill, but also used a pizza pan this time (one with little holes in it), which made for a much easier grilling process. I have been loving playing with pizza, and think it should be a new little segment around here. Segment. Like we're on a talk show, you know? This is my favorite topping combo to date! Shape dough into a ball and transfer to a lightly oiled bowl; turn to coat. Cover with plastic, and let rise in a warm place until it doubles in volume. Press it with your finger to see if it's done; an indent should remain. Meanwhile, scrape dough out of the bowl onto floured surface, and cut it into 4 pieces. Shape into balls. Dust with flour, and cover with plastic. Let rest, 20 to 30 minutes, allowing dough to relax and almost double. Holding top edge of 1 dough ball in both hands, let bottom edge touch work surface (refrigerate remaining balls as you work). Carefully move hands around edge to form a circle, as if turning a wheel. Hold dough on back of your hand, letting its weight stretch it into a 12-inch round. Transfer dough to a lightly floured pizza peel (or an inverted baking sheet). Press out edges using your fingers. Jerk peel; if dough sticks, lift, and dust more flour underneath. Place dough onto oiled pizza pan. Place on grill preheated to medium high heat. Grill until crust is almost done. Put your favorite toppings on. Place back on grill (lid down) until cheese is melted, edges are golden, and we like the bottom a bit blackened. pizza is totally my favorite food. when i told a friend that a couple of years ago, she said she thought that was only what jr. high boys said. oh well, call me what you will; pizza is my favorite. i have gobs of basil + garden fresh tomatoes begging for me to do something with them! oh yes there is NOTHING like homemade pizza. :) my husband has been perfecting his various crust recipes and i think he finally came up with a winner that we've been using over and over now (it's a half wheat, half white blend with a little rock sugar in it). so yummy, i'm drooling now, lol. This looks absurdly good. I wasn't craving pizza, until now! loving the new segment idea, sheena. pizza every week! woohoo! we made thin crust pizza last night with fresh mozz slices and herbs (from the garden!). so simple, and so good. pizza amazes me. and you've inspired me. i still need to try it on the grill. mmm. ever tried it in a cast iron pan? we like to do that sometimes too! My mouth is watering. I love your blog(s) by the way. yes please. this pizza looks amazing sheena! Yum! Margherita Pizza is my favorite - but I've never added olives and pine nuts. Love this idea! 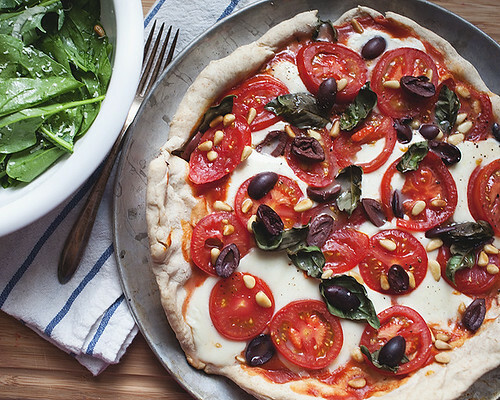 This pizza look ah-may-zing...I love kalamata olives and try to put them on as many things as possible.